ABACUS LETS YOU FILE YOUR EXPENSES--AND GET PAID BACK--IN REAL TIME FROM YOUR PHONE. Ted Power had just gotten his dream job at Google, but the first thing he experienced with the company was more like something out of the movie Office Space. Power says. "I was based in the New York office, but my manager was in California and she asked me to spend a month out there for orientation. I had to pay for the flight and the hotel out of pocket, which I couldn’t really afford considering I was fresh out of college. It was a couple months before I got reimbursed through their nightmare system. Considering how much companies like Google focus on employee happiness and tech, it was amazing how backwards the process was." Now Power wants to kill expense reports for good so no one else has to suffer. His new mobile app, called Abacus, lets employees ping a la carte expenses to their employers in real time, right from their phones. Managers can approve the reimbursements quickly, and then Abacus directly deposits the funds to the employee’s bank account. Power says. "The money is usually in your account within one to two business days. People love not having to wait weeks or months to get paid back." From an employee’s perspective, it sounds too good to be true. No saving receipts or filling out paperwork. Need to take a business trip? As soon as you buy the ticket or book the hotel, just ping the dollar amount to your boss and wait to get paid back. But what about the other side of this user experience--the boss "on the other end" of Abacus? Won’t he or she be getting spammed every other minute with piecemeal charges to approve? "Sometimes managers new to Abacus worry that these notifications will get annoying--we worried about that, too. What we’ve found is that managers usually like the transparency of knowing what their team is up to, and it’s a great opportunity to send a little love to your employees by getting back to them quickly. You can turn off the notifications, and only do it once a week or once a month, but most people do it daily or every couple days." Turning an irritating administrative chore into something more like personal messaging sounds like a brilliant mind hack indeed. But for giant companies like Google with a lot of existing accounting infrastructure, Abacus probably won’t be able to come to the rescue. Powers who cofounded Abacus with Josh Halickman and Omar Qari says. "Right now we’re really focused on smaller companies, ~5-100 employees. This seems to be where the biggest need is--these companies need something better than a spreadsheet, but they don’t yet have super complicated Oracle-type accounting tools." Still, Power says that "a few big companies" are test driving Abacus with internal teams, and Pinterest is using Abacus specifically to reimburse prospective employees’ travel expenses when they’re flown out for job interviews. That’s exactly the pain point that inspired Abacus’s creation in the first place, so Power and his team must be on the right track. COMMENTARY: I like the idea for Abacus, but I wonder, given the formal accounting and payables procedures of big companies, who detest cutting checks on the fly, but usually schedule payments once a week, whether they will subscribe to an app like Abacus. On the other hand, smaller companies (less than 100 employees), like the ones Abacus is targeting, have a bit more flexibility, and a whole lot easier to sell to. "Admittedly biased, but thus far, we've had a positive response from our customers. They range in size from small founding teams all the way up to 200 employee companies. I'd say the biggest pluses for them are the fact that there literally is no more 'expense report', so employees and manages can do everything in realtime and we do next day direct deposit reimbursements for employees. The biggest complaint thus far from administrators has been that they want more accounting integrations - we've already launched QuickBooks and Xero, but working on Netsuite now." I am glad to see that Abacus is working rapidly to make their expense report app integrate with small business accounting software like QuickBooks. This is a must have. But, why stop with expense reports? Abacus should consider adopting their app for paying independent contractors/consultants and temporary workers employed by temp agencies. It shouldn't be too difficult to process weekly timesheets in real-time by having contractors, consultants and temps submit their timesheets via the app. If the app could allow employers to signoff the timesheets using a digital signature input, the timesheet could be downloaded to the agency or employer for approval and payment, just like expense reports. High-tech companies would embrace contractor payments because they are the largest employers of contractors like programmers, software engineers, systems designers, IT professionals, accountants, etc.. If Abacus could integrate their app with corporate enterprise accounting systems (SAP, Oracle, etc. ), this would open a huge opportunity to take the Abacus app to the next level. Having worked on both sides of the corporate fence -- small and large corporations -- expense reports and contractor payments are an accounting nighmare. Businesses spend countless hours auditing, approving, coding and processing expense reports and contractor timesheets. I believe that Abacus has a huge upside potential. With sufficient capital, adequate staffing, and the right type of sales and marketing push, Abacus should be able to signup thousands of clients. If I were Abacus, I would signup as many clients as possible. To make it easy, I would offer the app for free for 30-to-90 days before I started charging. The company also needs to get client reviews on their website. Nothing works better than to have your clients advertise on your behalf. Having said this, my greatest fear is that a large payroll processor like ADP or accounting software maker like QuickBooks will compete with Abacus by develop similar software to expand their business. A buyout is also not too far-fetched. THE MOD-T 3-D PRINTER IS THE FIRST RELEASE OF FROG VENTURES, THE VENTURE DESIGN ARM OF ONE OF THE WORLD'S MOST PROMINENT DESIGN FIRMS. Today, a 3-D printer called the New Matter MOD-t hits Indiegogo. It’s expected to cost $250, making it the most affordable 3-D printer to date (comparable printers are in the $350 to $1,300 range). It’s also being billed as one of the simplest 3-D printers: users buy and download designs for chess pieces or kitchen utensils or whatever they want to make in a storefront that crosses the App Store with Etsy. They can then edit these objects--changing size or adding texture--about as easily as adding an Instagram filter. The printer, engineered by inventor Steve Schell, is expected to be built with a third of the parts of its peers, allowing it to reach that $250 price point. The MOD-t is the first release of Frog Ventures, the venture design* arm of Frog (think venture capital, but with the investment being design rather than money). Frog Ventures backed Schell's startup New Matter to bring the MOD-t to market. Frog is the design consultancy behind some of the most important products in recent history--Apple’s early line of computers, for example. But in recent years, Frog has become less known for physical products. That's in part because the company has developed expertise in software but also because the Fortune 500 companies that hire Frog for product design work are secretive. “We do work for some very very big clients, and those very very big clients are quite proprietary about their relationship with us," Ethan Imboden, head of Frog Ventures, says. This secrecy may sound cool, but the reality is a burden for Frog, creating what Imboden calls “a vacuum of content” as to what Frog is doing. No doubt, it’s one reason that when everyone talks about Frog, they (even we) still talk about Apple. Frog Ventures is the firm’s development studio outside this cone of silence. It’s currently working with three startups--New Matter is the only one that’s public--to make big, showy bets on new products. Imboden says. Frog’s role in each of these startups may vary. One startup, for instance, has blocked time to embed itself in Frog’s offices to learn to think like Frog designers. In the case of the MOD-t, Frog's role was similar to the one they adopt with their secretive companies. Schell had developed the core MOD-t technology over at the technology incubator Idealab. While 3-D printers have intricate mechanics to float the build plate precisely in 3-D space (basically, moving the printed object around the needle-sized hose of melted plastic ink), the New Matter team had developed what they describe as a “unique mechanical solution” that reduced the clockwork of parts by a third. Meanwhile, Idealab had been in casual talks with Frog Ventures about new products in their pipeline. The MOD-t caught Frog’s eye. Frog and New Matter co-developed the MOD-t’s experience--the approach of using a marketplace where designers could sell their products the way software developers sell apps--and a team of roughly 12 from Frog built out much of the product. They polished the industrial design (the mechanics and the aesthetic). They created mockups of the digital app and marketplace. And they built the MOD-t brand itself--right down to shooting the Indiegogo video. Now, all New Matter and Frog can do is wait. Truth be told, it’s hard to imaging the MOD-t being anything but a monstrous hit in a crowdfunding world obsessed with 3-D printers already. But Frog is mentally prepped for failure. Imboden says. COMMENTARY: If Frog Ventures can raise the required capital to produce a commercial version of the Mod-T 3-D printer, and be able to price it at $250.00, and still make money, they are accomplishing something truly incredible. I think $495.00 would've been a far better price and given the company some "wiggle" room in case something goes wrong during the manufacturing process. The relatively high cost of 3-D printers has prevented this technology from taking off like smartphones and tablets have, and the low price point of the Mod-T 3-D printer and quality features of the product certainly allow this new product to standout in the marketplace. On Tuesday, September 10, 2013, Apple unveiled its new flagship iPhone 5S and a new budget smartphone, the iPhone 5C, as it seeks to attract more customers and revitalize interest in its devices. The launch comes as the Cupertino, Calif., company faces heightened competition. Apple has been losing market share to rivals, such as Samsung, with its position in the most recent quarter falling to its lowest level in three years. As growth in the high-end smartphone market slows, Apple must find ways to attract new buyers, as well as expand into lower-priced phones. "The iPhone 5S the most forward-thinking phone we've ever created." The iPhone 5S includes updated components, comes in three colors (white, black and gold), and includes a fingerprint recognition sensor to unlock the device and make purchases. It will retail for $199 for 16GB, $299 for 32GB, or $399 for 64GB, all with a contract. Oh, and in the off chance that you're not a fan of cracked screens, Apple's also offering up proprietary cases that'll run you $49 a pop. It's made of high-grade aluminum and comes in silver, gold, and "a new space gray." The iPhone 5S also sports a new A7 processor. The A7 chip includes 64-bit capabilities, which brings the processing speed and capabilities of desktop personal computer microprocessors to the iPhone 5S. The iPhone 5S is "up to twice as fast" as the previous-generation system and has twice the graphics performance as well. There's OpenGL ES 3.0 on board, but the next-gen handset still promises, thankfully, to remain compatible with the 32-bit apps of yesteryear. Apple also incorporated a chip that it calls the M7. This is a "motion co-processor" that aggregates and monitors accelerometer, gyroscope, and compass data and offloads it from the A7. That enables a new generation of health and fitness apps, such as a new Nike+ Move app. The app keeps track of what users do, tracks their Fuel points, and lets them compete with friends. Battery life is on par with the iPhone 5. The 5S has 10 hours of 3G talk time, 10 hours of browsing over LTE cellular networks or Wi-Fi, 40 hours of music playing for all of your live Grateful Dead material, and 250 hours of standby. The iPhone 5 camera features a sensor that's 15 percent larger than the one on its predecessor as well as a five-element, Apple-designed lens with an f/2.2 aperture. Also on board is autofocusing matrix metering, so you can leave the arty blurring to Instagram. Even the flash is getting an upgrade this time out. Apple's offering up "True Tone," which features 1,000 variations of color temperatures to help you get things like flesh tones just right. The fingerprint reader folks were predicting ahead of launch. The iPhone 5S features a 170-micron-thick fingerprint recognition sensor with a 500 ppi resolution built into the Home button, dubbed Touch ID, that'll biometrically let you into the phone. It's still a physical button that a user needs to push down, but there's a metal ring that senses the person's finger. It can be used to unlock the phone or purchase items from iTunes. Oh, and if someone else wants to access your phone, you can also set the thing up to read multiple fingerprints. And before you ask, for extra security, all of that fingerprint information isn't stored directly to Apple's servers, because Apple apparently isn't in the market of collecting that info. The iPhone 5S is available for pre-order in three days. It'll start hitting Apple stores on the 20th of September in the US, Australia, Canada, China, France, Germany, Japan, Singapore and the UK. In December, that list will expand to include more than 100 countries. The iPhone 5 is going away, but the iPhone 4S will now be available for free with a two-year contract. The iPhone 5C, which is made of plastic, starts at $99 for the 16GB version or $199 for 32GB with a two-year contact. Phil Schiller said during the event. "The iPhone 5C is made with all the incredible technology that customers have loved with the iPhone 5, but there's more, too. It has an incredible new design -- one that's more fun, and more colorful than anything we've made before." The iPhone 5C has a polycarbonate wrap-around back. It will come in five colors -- green, white, blue, red, and yellow. The screen wallpaper will match the exterior of the phone. For the new iPhone 5C, Apple also designed $29 custom cases made of silicon with a microfiber lining. The new custom cases come in six colors: white, red, yellow, blue, green and black. Add one of the six Apple‑designed cases to your iPhone 5c and it instantly goes from colorfully cool to impossible to ignore. The case design allows the color underneath to show through, creating 30 fun possibilities. So the iPhone 5c Case does more than just protect your phone — it helps it stand out. And it helps you make it yours. The iPhone 5C will sport a 4-inch retina display, like the iPhone 5, as well as an A6 chip inside with "blazing-fast performance." The battery is larger than in the iPhone 5, and it includes an 8MP iSight camera, with the five-element lens and IR filter as seen on the 5. The iPhone 5c also comes with a new Camera app that raises your photography game. Now you can shoot images in a square format. And choose from eight live filters than can be applied before or after you take your photo. Use the Instant filter to give a group shot at the beach a vintage color look. Make a sunset even more vivid with the Chrome filter. Or choose Noir to capture a self-portrait in dramatic black and white. The iPhone 5C also represents Apple's chance to broaden its market. While its smartphones are popular around the world, the majority of people in places like China can't afford $800 phones. The company plans to host an event in China later this week, where it is believed that Apple will announce a partnership with China Mobile, the world's biggest carrier. "The biggest change to iOS since the introduction of iPhone." But, there is good news for owners of older iPhones. On September 18, you'll be able to download the latest version, iOS 7 onto your older iPhone (models dating back to the iPhone 4), iPad (version 2 or later), iPad Mini or iPod touch (fifth generation). Here's a look at ten key new features. Control Center: Swipe up from any screen to immediately jump into system settings such as Bluetooth and Wi-Fi, as well as brightness controls, a flashlight, calculator and other utilities. Camera app: When the camera app is open, beyond stills or video, you'll get two other labeled options: shooting the photo as a square picture or a panorama. You can also edit photos with Instagram-like filters. Photo app: Apple is bringing organization to hundreds of photos, using the camera information about where and when they were shot to organize them into "Moments," "Collections" and "Years." Find My iPhone lock: A new "activation lock" feature requires your Apple ID and password before you can turn off Find My iPhone, further thwarting thieves. AirDrop: The new feature is Apple's answer to Samsung's Galaxy S line of phones, which let other Galaxy users share photos and other files by clicking the phones together. AirDrop lets other iOS users send items directly to each other, without opening up a text message or e-mail to do so. A slightly different version of the AirDrop feature has already been available on Apple's latest Mac computers. Multi-tasking: Apple has improved multi-tasking. By pressing the home button twice, you can see preview screens of all your running apps and swipe to move from one to another. By swiping up you can delete an app. Background updates: The new iOS will update apps automatically in the background and does so when you're plugged into Wi-Fi. The idea is that fetching such updates won't kill your battery. iTunes radio: Apple's answer to Pandora will be available on computers and mobile devices when it arrives with the new operating system on Sept. 18. The program brings in pre-programmed radio stations to iTunes, and will let listeners create stations based on their favorite artists. Safari: Apple's new look for the Safari browser will let you see more of your content and includes full-screen browsing. There's also a "smart search" field that unifies separate search and address fields into one, and a cool new tab view for scrolling from one page to another. Siri: You'll find new male and female voices in Siri. Also new: Twitter search integration, which lets you ask Siri what people are chatting about on Twitter. Siri also now taps Wikipedia as a resource as well as Bing search. Design: Not to be underestimated is the overall look and feel of the operating system. With freshly designed fonts, icons and animations — a flash of lightning, say, in the weather app — you may feel like you have a new phone without actually buying the latest hardware. COMMENTARY: CEO Tim Cook is stuck in a no-win situation. On Tuesday, he was master of ceremonies of the unveiling of the new iPhone 5S and budget-priced iPhone 5C that seemed to please no one. The unveiling event was short on surprises, and the new iPhone's played it safe for the most-watched company in the world. Cook was criticized for pricing Apple's new cheaper iPhone 5C too high. By making the 5C a midrange product instead of a low-end smartphone, he protected the company's profit margins — and left a large swath of the market open to rivals selling inexpensive Google (GOOG) Android-based smartphones. His decision on pricing also preserved Apple's reputation as a premium, aspirational brand. But Cook sacrificed the opportunity to increase Apple's smartphone market share and boost unit sales and revenue in order to maintain the company's business model and image. On selling a cheap iPhone, Cook is damned if he does and damned if he doesn't. And Apple stock was down nearly 6% in midday trading in the stock market Wednesday. As for the lack of surprises at the product launch, Apple is battling media leaks from supplier partners and lofty expectations set by its history of groundbreaking products under the late, great Steve Jobs. Even when it did announce something unexpected on Tuesday, the media mostly shrugged, failing to see the significance. Tech bloggers had photos weeks in advance of the iPhone 5S fingerprint sensor, dual-LED camera flash, the gold model 5S, and the colored plastic cases of the iPhone 5C, but they didn't predict everything. Those surprises, mostly overlooked Tuesday, concerned the details of advanced components and software in the new phones. New A7 64-bit microprocessor chip that promises to deliver processing speeds twice as fast as its predecessor chip. New M7 motion co-processor that gathers data from the accelerometer, gyroscope and compass to offload work from the A7 for improved power efficiency. Free productivity apps available on both the iPhone 5S and 5C including Pages, Numbers and Keynote, which previously cost users $9.99 and let users create, edit and share documents, spreadsheets and presentations, and iPhoto and iMovie, which previously cost users $4.99 for editing snapshots and videos. Making Pages, Numbers and Keynote available for free could make the handsets even more popular with professionals. Those software products compete with offerings from Microsoft (MSFT) and Google. The pressure on Apple's CEO is likely to intensify in the months ahead. Cook has promised "amazing" products to be rolled out through 2014 and he had better deliver. Whether those include the rumored iTV television and iWatch smartwatch remains to be seen. During a press event at IFA on September 9, 2013, J. K. Shin, President of Samsung mobile communications, revealed some interesting sales figures for the Galaxy Note and Galaxy Note 2. According to Shin, Samsung has sold over 38 million Galaxy Note devices over the past two years. That is a very healthy number and raises the question yet again about large screen smartphones (5 inches and over) verses smaller screen smartphones (4 to 5 inches). Apple has rigidly stuck to the smaller end, but iPhone fans seem happy with Apple’s choices since the iPhone continues to sell well. However Samsung has taken a different approach in that it offers phones with a variety of screen sizes including the popular Galaxy S3 (4.8 inches) and the Galaxy S4 (5 inches). If Samsung, HTC, LG and others are able to sell millions of phones with 4 to 5 inch displays plus the very same companies are able to sell millions of units featuring even larger displays then it is clear that consumers cherish the choice and that larger screen phones are not just an odd statistical blip. Shin didn’t elaborate any further or breakdown the number per year or per device, but he did add that Samsung expects to sell at least 10 million Galaxy Note 3 phones. The 10 million figure is probably low, or maybe only a short term prediction, as both the Note and Note 2 sold in greater quantities. The Samsung Galaxy Note 3 will go on sale internationally from September 25 except for in the U.S. and Japan where it will be released during October. Large display phones, also referred to as "phablets," because they resemble a hybrid between a phone and tablet, out sold tablets and laptops combined during Q2 2013, but Apple got exactly zero of those sales. According to several mobile technology analysts, iPhone owners are crying for an iPhone with a larger display. Having said this, you have to question why Apple CEO Tim Cook never considered producing the iPhone 5S with a 5-inch display as a defensive strategy. There is no longer any doubt that there is a demand for large display phones. If an iPhone phablet is in the works, why put it off when the market for them is boiling hot? Apple made a similar mistake with the iPad, when Steve Jobs called 7-in tablets like the Amazon Kindle Fire and Samsung Galaxy Tab as "dead on arrival." Well, surprise, surprise, Amazon sold 10 million 7-inch Kind;e Fire tablets over the next 12 months from it launch. Apple finally realized this mistake, and introduced the 7.9 inch iPad Mini in 2012. But, that was a rush job, the iPad Mini is under-powered and has an inferior display. I thought about buying a 9 or 10-inch tablet, and was even leaning towards an iPad, but after seeing and reading the reviews of Google's Nexus 7 2nd generation 7-inch tablet in early August, I bought one. Now I am leaning towards a 5-inch phone. For those readers interested in the iPhone 5C and 5S technical specifications, check this out. For more detailed iPhone 5S and 5C technical specifications refer to GDGT1 and GDGT2. Samsung on Thursday officially took the wraps off the Galaxy S4, a 5-inch smartphone coming to all the major U.S. carriers during the second quarter. Journalists packed Radio City Music Hall tonight for the big reveal, which – as expected – was brought on stage by Samsung's pint-sized pitchman, Jeremy. Samsung's mobile chief, JK Shin, touted the Galaxy S4 as "a life companion for a richer, simpler life." "We are committed to innovation, we are always listening to learn from people around the world about what kind of progress they really want." The smartphone will roll out with 327 mobile operators around the world in 155 countries starting at the end of April, he said. The revamped smartphone, which follows last year's Samsung Galaxy S III and Galaxy Note II is "slimmer yet stronger, less to hold yet more to see, [and] it is simply amazing," according to Shin. The Samsung Galaxy S4 is 136.6 by 69.8 by 7.9mm and 130g, the same height but slightly slimmer both in width and depth than the Galaxy S III. The edges are a little squarer than the GS3's, but the phone is still made of plastic. It comes in two colors, "black mist" and "white frost." There's a 5-inch, 1920-by-1080 Super AMOLED screen on the front with a very tight 441ppi density. New software on board alters the screen's color temperatures based on what kind of content you're looking at, for the best possible view. The processor inside is either a 1.6-GHz Samsung Exynos 5 Octa or a 1.9-GHz Qualcomm S4 Pro, depending on the country. The phone has 2GB of RAM and either 16, 32 or 64GB of storage, plus a MicroSD card slot. It runs Android 4.2.2. There's a 13-megapixel camera on the back and a 2-megapixel camera on the front. The cameras can actually be used together to shoot picture-in-picture photos and videos. For networking, the GS4 has EDGE, HSPA+ 42 and LTE; there will also be a CDMA/LTE version. Wi-Fi 802.11 a/b/g/n/ac, GPS, NFC, Bluetooth 4.0, and MHL are all on board as well. An infrared transmitter lets the phone work with the built-in WatchOn software to function as a TV remote and electronic program guide. The phone will support wireless charging if carriers demand it, the company said. The Galaxy S4 has a huge amount of new software and features beyond the Android baseline. Samsung's director of product marketing, Ryan Bidan said. "We wanted to give users a device that really understands what's going on around them." Samsung groups the new features into four categories. "Fun" features include a bunch of new camera modes including dual-camera picture-in-picture, time lapse, and animated GIF, and a "sound and shot" mode which lets you record nine seconds of audio with any image. The built-in "Story Album" app lets you combine pictures with location information from TripAdvisor and then print it all as a paper copy through Blurb. "Relationship" features include Group Play, which lets multiple Galaxy S4 phones play the same music track, show the same photos, or play multiplayer games over Wi-Fi Direct; Asphalt 4 and Gun Bros 2 will be the first two multiplayer games to be supported, Samsung said. S Translator builds language translation into both the email program and Samsung's ChatOn chat program, automatically translating between nine languages. "Convenience" features include WatchOn, a universal remote control app which works with the phone's IR emitter. It combines data from the Peel electronic program guide along with streaming choices from Netflix, Blockbuster and Samsung's own media store, although it can't access DVRs. Smart Pause pauses videos when you look away. Gesture control lets you scroll the screen or fast-forward music by waving at the screen. Air View lets you preview items like e-mail messages by hovering your finger over them, like you can do with the S Pen on the Galaxy Note. An OCR program reads business cards. "S Health" features take on Fitbit and its ilk with a built-in pedometer, environmental sensors and diet guide. Samsung will sell Fitbit-like bands for people to wear when they aren't carrying their phones with them, and the biometric data will sync back to S Health, the company said. All of these features interact with the new Samsung Hub, a unified app, movie, video, book and music store that will appear on Galaxy S4 phones. No Samsung event would be complete without a theatrical performance. Samsung showed off the Galaxy S4's camera functionality with a scene at an Upper West Side dance studio, where Jeremy's mother was all set with the GS4, but his classmate's dad was out of luck. Then, of course, Jeremy tapped danced – all captured by the new Galaxy S4. Flash to two friends traveling around the world, which gave Samsung the chance to show off S Translator, as well as photo album options. In concert with blurb, Galaxy S4 owners will be able to order hard copies of their albums for $10-$30 for a 20-page album. To cut down on the distracted driving, meanwhile, S Voice Drive features bigger fonts and bigger text to speech for drivers. It's intended to serve as an in-car personal assistant, and allows users to respond to texts, calls, and other messages by voice. For those in cooler climates, meanwhile, the Galaxy S4 works for those wearing gloves. The Galaxy S IV will come out on all four national U.S. carriers plus U.S. Cellular and Cricket between April and June of this year; Samsung didn't cite a price. T-Mobile has set up a pre-registration page, but the other carriers had few other details about the Galaxy S4 at this point. Jeff Bradley, senior vice president of devices of AT&T said. "AT&T was the first to deliver Samsung's Galaxy series and we are excited to bring the Galaxy S4 to the nation's fastest 4G LTE network. We continue to offer our customers a broad choice of devices and features to fit any mobile lifestyle, and look forward to growing our family of Samsung Galaxy devices." Fared Adib, senior vice president of Product Development at Sprint said. "Sprint is excited to bring the benefit of Truly UnlimitedSM 4G LTE data to the U.S. variant of Galaxy S 4 in the second quarter of this year. Our customers will appreciate the ability to use Galaxy S 4 to surf the Web, share pictures and videos, and use this smartphone as much as they want without worrying about throttling or overage charges on their monthly bill due to data caps." As you can readily conclude from the above Technical Specifications comparison between the Samsung Galaxy S4 and three other leading smartphones -- Apple iPhone 5, HTC One and BlackBerry Z10, the S4 is clearly superior in every major technical specification. "Fun" features, which now includes dual-camera picture-in-picture, time lapse, and animated GIF, and a "sound and shot" mode which lets you record nine seconds of audio with any image. Very cool indeed. "Relationship" features, which allow users to interact with others by sharing content like multiplayer games, music and photos. This includes Group Play, which lets multiple Galaxy S4 phones play the same music track, show the same photos, or play multiplayer games over Wi-Fi Direct; Asphalt 4 and Gun Bros 2 will be the first two multiplayer games to be supported, Samsung. The S4 comes with Samsung’s S Translator tool that enables you to speak in one language and have the phone translate to another. When someone responded in Chinese, the phone typed out his words in English. It supports several other languages including French, Spanish, Italian and Portugese. "Convenience" features, provide a storehouse of intuitive and automatic features to help improve the overall S4 owner experience. This includes WatchOn, a universal remote control app which works with the phone's IR emitter to faciliate video stream from Netflix, Blockbuster and Samsung's own media store. My favorite convenience feature is Smart Pause which pauses videos when you look away. The Gesture control lets you scroll the screen or fast-forward music by waving your hand over the screen. The Air View control lets you preview items like e-mail messages by hovering your finger over them, like you can do with the S Pen on the Galaxy Note. An OCR program reads business cards. The S Voice Drive voice recognition feature outclasses Siri. You can ask it to read your email out loud and ask the phone to respond to a text message while you’re driving. Now that's cool. "S Health" features, provides a built-in pedometer, environmental sensors and diet guide. Samsung will sell Fitbit-like bands for people to wear when they aren't carrying their phones with them, and the biometric data will sync back to S Health, the company said. That's a neat medical device that is sure to attract the attention of athletes and the health conscience. Although Samsung lost a patent infringement suit against Apple in 2012, and demonstrated stone cold audacity and defiance by paying the settlement in coins -- $2 billion worth -- and delivered by several armored trucks in front of Apple's HQ, it now has the last laugh. It is now giving those arrogant bastards at Apple lessons in innovation and oneupmanship. Marius Watz announced to an appreciative crowd at the start of a talk in Brooklyn recently. Mr. Watz, a Norwegian-born artist, was describing his work with MakerBot, a new consumer-grade, desktop-size 3-D printer. With some assembly and do-it-yourself tinkering, the MakerBot makes, or “prints,” three-dimensional objects from molten plastic, creating a piggy bank, say, or a Darth Vader head from a computer design at the touch of a button. Mr. Pettis, 38, who worked as a middle school art teacher in Seattle before starting the company with Zach Hoeken Smith, 28, and Adam Mayer, 35, hardware and Web developers. They met at a Brooklyn hacker space.) As part of their mission, MakerBot’s founders also embrace sharing: users are encouraged to post their designs for the machine on a company blog, Thingiverse, where anyone can have access to them, to print or modify. Pettis, like many people in the MakerBot universe, speaks with the zeal of the technologically converted. He said, clutching a brightly colored plastic doodad. Probably, though the MakerBot has its limits — it can print objects that are at most five inches on a side, at relatively low resolution. Mr. Hebel, an engineer from upstate New York, demonstrating his little holder, which he invented for the show-and-tell said. Mr. Watz, who is represented by the DAM gallery in Berlin, noted dryly at the open house. Nonetheless, he posted some of his technical specs on Thingiverse, explaining that he didn’t want to take advantage of the generous community spirit there without giving back. Now they are imagining other things they can use their machine for, on a much bigger scale. Mr. Bell said. MakerBot Thing-O-Matic® 3D Printer - A kit you can assemble to create the latest in cutting edge personal manufacturing technology. Includes the new StepStruder® MK7 Complete Upgrade! PRICE: $1.099.00. Allow 3 weeks for delivery. 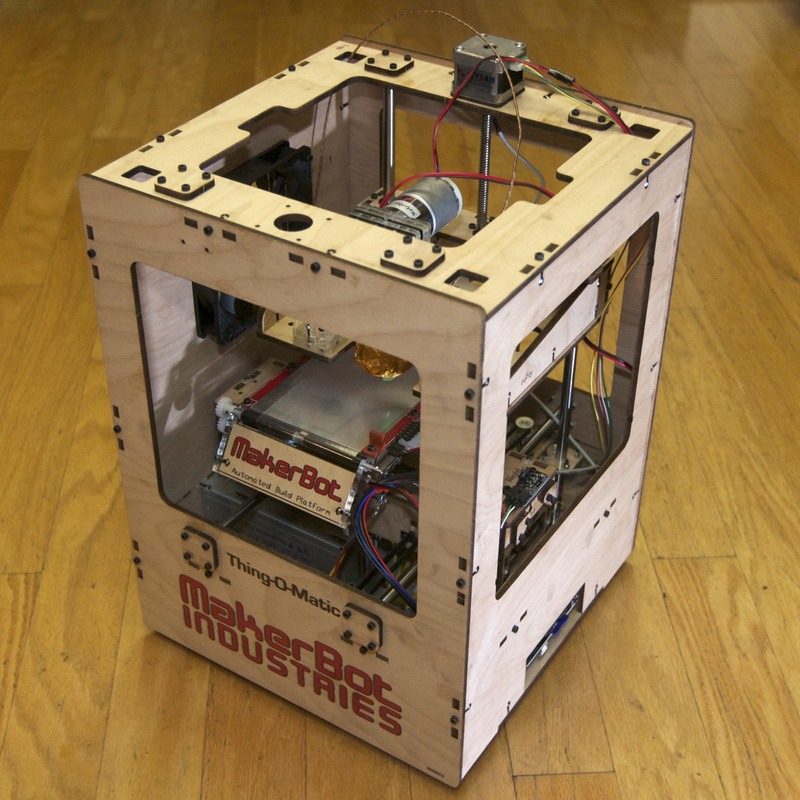 Here's a time lapse video that shows how to assemble the MakerBot Thing-O-Matic 3D Printer kit. Here's the MakerBot Thing-O-Matic in action printing a Buddha head. It took 1 hour and 13 minutes to print the Buddha, but the video speeded it up considerably. That's so cool. MakerBot Replicator™ - The ultimate personal 3D printer, with single or dual extrusion (2-color printing)--and a bigger printing footprint, giving you the superpower to print things BIG! Comes pre-assembled. PRICE: $1,749.00 (single extruder) and $1,999.00 (dual-extruder) Pre-Orders Only - Allow 6 weeks. In this video Bre Pettis, CEO and Co-founder of Makerbot Industries, reveals the newest generation of MakerBots - The Replicator! This is the first footage of The Replicator ever to made visible to the public! Find out what makes The Replicator awesome and why you are going to want one! January 9, 2012 was a big day for the newly launched MakerBot Replicator™ when it was unveiled at the world famous Computer & Electronics Show (CES) 2012 in Las Vegas. The latest in open source 3D printing features the ability to use two print heads for two-clor printing or printing with dissolving support material. Not only does this printer feature the largest build area ever for a MakerBot, but best of all it ships to you fully assembledand ready for printing! For more info check out these great posts! MakerBot Industries is excited to announce the launch of its latest product, The MakerBot Replicator™, which will debut at CES in Las Vegas, NV on Tuesday, January 10th. The 2012 International CES in Las Vegas runs from January 10-13 and the CES convention and exhibit takes place at the Las Vegas Convention Center in Las Vegas, Nevada. Tickets at the gate are $200.00 for individuals who did not pre-register. MakerBot's booth is located in section South 4, Booth 36839. To locate MakerBot's booth or the booth of other exhibitor's an interactive floor plan can be found HERE. To enhance your experience you can download the official CES app for your iPhone or iPod Touch HERE. If you own a MakerBot Thing-O-Matic or have seen the new MakerBot Replicator™ in action, we welcome your feedback.